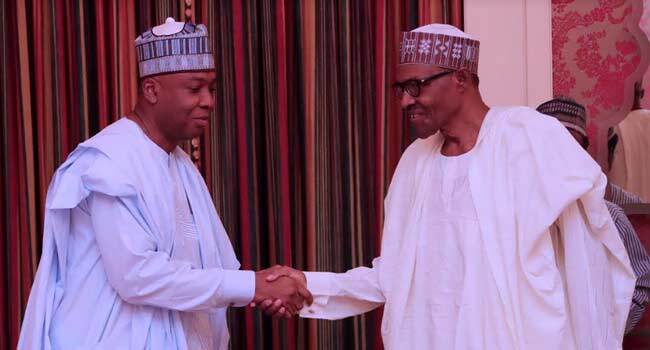 President Muhammadu Buhari on Saturday said Senate President Bukola Saraki’s decision to rely on the judicial process in his trial for false assets declaration is worth emulating. According to the President, the country’s judicial system, no matter the challenges it faces, is truly working and no one should be allowed to undermine or break it. “I have seen many instances where individuals and groups seek the destruction of the judicial institution in the foolish thinking of saving their skin, instead of going through the painstaking process of establishing their innocence,” the President was quoted as saying in a statement by his Senior Special Assistant on Media and Publicity, Mr Garba Shehu. The President was reacting to the Supreme Court ruling on Friday, which freed the Senate President of false assets declaration charges brought against him by the Federal Government. Dr Bukola was tried by the Code of Conduct Tribunal which acquitted him of the charges against him, but the Federal Government rejected the ruling and headed to the Court of Appeal. In its ruling, the Court of Appeal had asked the Senate President to be retried on three counts of false assets declaration. The ruling prompted him to take his case to the Supreme Court which upheld his appeal. President Buhari believes the Senate President’s journey from the lowest to the highest court of the land provides an important example that all Nigerians should emulate.